Bill criminalising the filming of Israeli security forces underscores the state’s chilling suppression of Palestinian rights. In the aftermath of numerous tragic incidents in which Israeli human rights NGOs and Palestinian activists have documented the maiming and execution of Palestinian suspects by security forces, a ministerial committee has approved a new bill criminalising such filming. They did this despite the attorney-general criticising the bill for its extensive legal defects. Notes accompanying the proposed law state that pro-Palestinian organisations have made a practice of documenting Israeli army soldiers, “waiting impatiently for activities that can be biased and tendentious – and through them [the soldiers] can be disgraced”. Now, the measure goes to the full Knesset for passage. It appears to have massive support from the far-right government. If it becomes law in its current form, anyone who photographs or videotapes a soldier on active duty - no matter what they are doing - could face criminal prosecution and a five-year prison sentence. The bill was proposed in the aftermath of the infamous incident in which Israeli soldier Elor Azaria executed a wounded Palestinian. By happenstance, a Palestinian who worked for the Israeli NGO B’Tselem filmed the incident, and the organisation released it to Israeli media, sparking a firestorm of protest - not so much for the murder, but because a Palestinian had the temerity to expose the misdeeds of an Israeli soldier. Israel has become a country in which actions by its security forces, which would be scrutinised and punished severely in most democratic countries, are routinely glossed over. 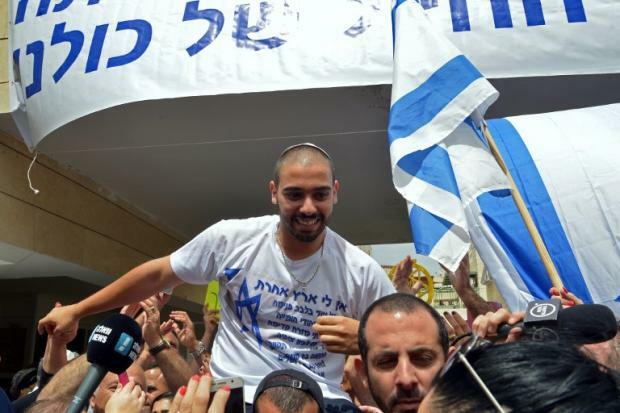 Azaria became a national hero to a large cross-section of the Israeli public. Municipalities featured billboards celebrating him, and tremendous pressure was exerted on the army not to prosecute him. Although Azaria was ultimately convicted and sentenced to 18 months in prison, he was released after just nine. His hometown of Ramla gave him a hero’s welcome home. Only half-jokingly, I suspect he will next be offered a high placement on the Likud Knesset list, with a cabinet position in the offing. Israel has become a country in which actions by its security forces, which would be scrutinised and punished severely in most democratic countries, are routinely glossed over. It’s also important to note that there are scores of similar incidents in which there is no documentary evidence and no form of justice offered: no charges, prosecution or sentence. Israel only prosecutes when state personnel are caught red-handed, and even then, they do so reluctantly and half-heartedly. A perfect example of this was the killing of Gaza volunteer medic Razan al-Najjar at the Great Return March protest. Though she approached the fence with her hands raised in order to aid a wounded protester, she was deliberately shot in the chest and killed. Though the killing was photographed, there was no documentation of the killer. Israel knows who fired the fatal shot, but it will not investigate this as a potential war crime, because it doesn’t have to. One of Haaretz’s most courageous columnists, Gideon Levy, has voiced defiance of the proposed law. He’s proclaimed his intent to violate it and encouraged others to do so. However, Israelis will likely face far less or no punishment for such violations; it is Palestinians who will feel the full force of the state. It’s also worth noting that Levy, Haaretz’s most outspoken columnist defending Palestinian rights, has faced the wrath of far-right Israelis who regularly threaten his life. Though Israel proclaims itself to be a democracy and seeks to be compared to western democracies rather than its Middle Eastern neighbours, its decline into autocracy and theocracy far more closely resembles countries like Saudi Arabia and Iran. Israel suppresses controversial speech, as it did when it violently broke up a protest rally against the murders of Gaza protesters. Its military censorship regime routinely prohibits journalists from covering major national security stories. It has legislated fines against citizens or companies that honour the BDS movement or recognise the Palestinian Nakba. The next step on the road towards total tyranny might be arresting the leaders of the Israeli human rights community and outlawing the existence of the major NGOs doing this lonely, valuable work - and it has already made moves in this direction. Meanwhile, the Black Lives Matter movement has shown how critical it is to document the abuses of police forces who harass, and even murder, members of poor minority groups. Almost every week, a new video surfaces to confirm that local police are riddled with racism and violent abuse. Were it not for such documentation, ordinary citizens would not be able to hold officers of the law accountable. US communities are demanding that officers be outfitted with body cameras, both to document police behaviour and to restrain it before abuse happens. Israel is moving in the opposite direction as, Levy notes, it wants to remove cameras from the occupied territories in order to continue its methods of Wild West policing unmonitored. In a true democracy, most citizens would not just welcome cameras and documentation - they would insist they were key elements in preserving the rule of law and civil rights, values critical to a healthy democracy. Richard Silverstein writes the Tikun Olam blog, devoted to exposing the excesses of the Israeli national security state. His work has appeared in Haaretz, the Forward, the Seattle Times and the Los Angeles Times. He contributed to the essay collection devoted to the 2006 Lebanon war, A Time to Speak Out (Verso) and has another essay in the upcoming collection, Israel and Palestine: Alternate Perspectives on Statehood (Rowman & Littlefield).